➤ Listen to Anmarie’s radio interview. Minnesota law establishes that Minnesota government policy is to protect children’s emotional and physical safety. 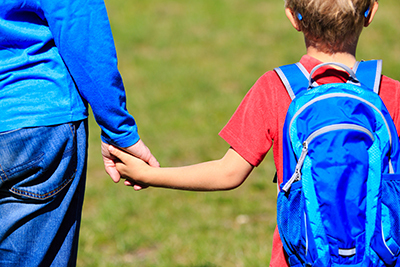 Laws also recognize children’s right to a reasonable expectation of personal privacy. Research confirms that violating children’s privacy causes emotional and mental harm. The Child Protection League is united in action to protect all children from exploitation, indoctrination and violence. The CPL educates people on issues that threaten the safety of children. Yes! I want to help protect parental rights with a donation to the Protect Children’s Privacy and Mental Health Fund. Anmarie Calgaro interviews with EWTN regarding filing an appeal to her parental rights case. CPL will contiinue to support Anmarie and fight on behalf of all parents until MN enacts legislation to close the emancipation loop hole that endangers young people and violates parental rights. Listen to Anmarie Calgaro’s lawyer, Erick Kardaal, interviewed by national radio host Janet Parshall, as he discusses her case and other issues regarding parental rights in Minnesota. The interview starts at the 8:50 time mark. Erick Kaardal, attorney for Anmarie Calgaro, appealed the decision of St. Paul District Judge Paul Magnuson that dismissed Calgaro’s lawsuit. Judge Magnuson ruled on May 23rd that Calgaro’s civil rights were NOT violated despite the fact that these entities treated her minor son as an adult, providing services and benefits to him without her knowledge or consent. Read more about the appeal…. St. Paul District Judge Paul Magnuson dismissed all claims against state and county agencies and a private health facility, ruling that Anmarie Calgaro’s civil rights were NOT violated despite the fact that these entities treated her minor son as an adult, providing services and benefits to him without her knowledge or consent. 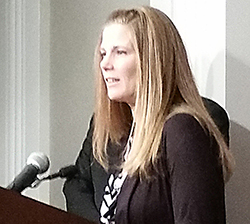 MN Mom in Court Thursday to Restore Parental Rights, Show up for her! She’s standing up for you! On Wednesday, November 16th, a northern Minnesota mother filed a civil rights lawsuit in federal district court. She is asking the court to restore her 14th amendment constitutional due process rights which she claims were violated when her parental rights were suddenly and arbitrarily removed. [See Press Release]. In June, 2015, without her knowledge, consent, or involvement, Anmarie Calgaro’s fifteen-year- old son obtained a “Notice of Emancipation” from Mid-Minnesota Legal Aid, a nonprofit agency that provides free legal services to low income people. Using this document alone, state agencies and private services shut Anmarie out of every important physical, emotional, and educational decision her minor son was making. Suddenly and without notice, she no longer had access to his school or health records. Without her consent, the state issued him a state driver’s license and county health services approved housing and other county services. A private health service began prescribing dangerous hormonal drugs to ‘transition’ him from male to female. This health service never consulted her, even though these controversial and largely untested drugs cause potentially irreversible effects and have unknown long-term risks. He was even prescribed narcotics from another health service. Clearly, Anmarie’s God-given and constitutionally protected parental rights have been violated. And her responsibilities to care for her son’s physical and emotional health and safety have been blocked by the actions of these agencies and services. She has been denied the chance to plead her case in court. Anmarie, her family, and her son have been grievously harmed by this unconstitutional collusion of groups that exclude her from the on-going medical, physical, and emotional care and education of her own child. Outside agencies cannot fully understand the physical background, personal struggles, insecurities, strengths, weaknesses, fears and dreams of her child without talking to her. Nor can a struggling child of sixteen be considered capable of making fully informed and life changing decisions like this. For his safety and for his welfare, Anmarie wants and needs to be involved. 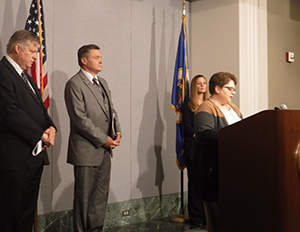 The Minnesota Child Protection League (MN CPL) is supporting Anmarie’s legal challenge because her rights and the welfare of her son have been outrageously trampled upon. MN CPL is also supporting her legal challenge because this is happening to other families around the country. [See Michele Lentz’ statement here]. Attorney Erick Kaardal filed the complaint on Anmarie’s behalf with the support of the Thomas More Society of Chicago, a national nonprofit public interest law firm. Anmarie is asking the courts to declare that her due process rights under the 14th amendment of the Constitution have been violated, and to restore her full parental rights. She wants to help her son. She also wants to help other families in similar circumstances who have been deprived of their parental rights to help their own children. [See Anmarie’s statement here]. The Minnesota Child Protection League (MN CPL) exists to protect children from exploitation, indoctrination and violence. Listen to a radio interview with Anmarie. My name is Anmarie Calgaro. Last year, without my knowledge or consent, without any court hearings or legal process, without any involvement on my part whatsoever, a legal aid group that gives free services to low income people created a “Notice of Emancipation” for my 15 year old son. Suddenly, my son, without any notice to me was no longer under my supervision. Based on that piece of paper alone, he began receiving public assistance including medical services and housing/food support. The St. Louis County Health and Human Services treated him as an adult. I couldn’t get any information regarding my son, even the school refused to allow me to access his records. It was then brought to my knowledge that my son had begun receiving hormone treatments from Park Nicollet Health Services to transition from male to female with Medical Assistance paying for these treatments to assist in the transition. I was not consulted of informed about this in any way. I had no way to give or receive information about his important healthcare needs. Since then Fairview Health Services of Hibbing has also prescribed narcotics to my minor son. I am forbidden to be involved with his important health needs. The news that county agencies, health service providers, the school and other county and state offices were completely bypassing me came as a complete and total shock! Why wasn’t I even notified? I believe that my Constitutional Civil Right to have my case heard in a court of law has been stripped from me. If this had been a child custody case, I would’ve had my day in court. If my son were to be placed in foster care, or if he had been referred to Child Protection, I would’ve had my day in court. I am firmly committed to what is best for my son. I am his mother. He is and always has been welcome in our home. He has 3 older siblings and 3 younger which still live in our home. I love him beyond words and I and our entire family care deeply about his well being. As a mother, I know his emotional and physical needs in a way no one else can. I also have a commitment to him that no one else has and I feel not only was I robbed of the opportunity to help my son make good decisions but that he was also robbed of a key advocate in his life, his mother. I am taking this action today so that the courts will recognize my due process rights under the United States Constitution, and so that, for the good of my son, the courts will restore my parental rights. I am also taking this action for the benefit of all parents and families who may be facing the same violation of their rights, so that they and others in the future, might be spared from suffering the same tragic events. The Child Protection League (CPL) exists to protect children from exploitation, indoctrination and violence. CPL is eager to support Anmarie Calgaro in her legal challenge to the grievous assault on her parental due process civil rights, protected by the 14th amendment to the U.S. Constitution. We are grateful she is willing to take this bold step, because she gives voice to countless parents and families across the country that are being similarly harmed. St. Louis County Public Health and Human Services, Park Nicollet Health Services, Fairview Health Services of Hibbing, and the St. Louis County School District have essentially eliminated Ms. Calgaro’s parental rights. Based on nothing more than a statement of “emancipation” issued by the free services of a legal aid group, and without any court order, these entities are treating this 17 year old minor as if he is an adult. They are financing and prescribing dangerous hormonal drugs and prescription narcotics to a minor without his mother’s knowledge, involvement, or consent. She is blocked from even viewing his health and school records. For his safety and for his welfare, Ms. Calgaro wants and needs to be involved with the on-going medical care and education of her child. She is denied any avenue to plead her case in court. Children are too often being used as pawns for the financial and political designs of special interest groups, groups that cannot have the level of regard for the personal, long-term well-being of a child as does a parent. Government agencies and health care providers should be protective buffers for minors. They should never be party to violating the rights of a parent to oversee the needs of her child. The decisions underage children make about themselves often have permanent consequences that will affect their relationships, their families, their health and their emotional stability for a lifetime. And yet, the very person who knows, loves, and is most deeply committed to her child, is being excluded from providing for him at his hour of greatest need. Few values are more sacred, more deeply regarded, than the nurturing bond of a loving parent/child relationship. Disregarding and trampling that bond severely harms children and families. CPL urges the court to declare that Ms. Calgaro’s due process rights under the U.S. Constitution have been violated and to issue an injunction restoring her full parental rights until her due process rights have been restored.